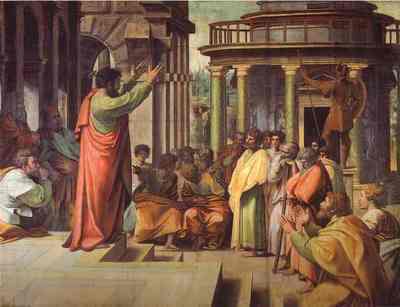 Paul and Barnabas had remained in Jerusalem for some time and they preached the word of God there. Paul decided to take Silas with him on the journey but Barnabas wanted to take John with him. Paul and Barnabas quarreled harshly over it. Finally Paul and Barnabas split. Paul took Silas and sailed to Syria and Cilicia but Barnabas took John and sailed to Cyprus. Paul did not want John as their helper because John abandoned them while they were at Pamphylia. When Paul and Silas came to Derbe and Lystra, they met a man named Timothy. Timothy’s mother was a Jewish Christian believer. Timothy’s father was a Greek. Everyone talked good things about Timothy and Paul wanted to take Timothy along with him. So Paul decided to circumcise Timothy because the Jews there observe circumcision. As they went through the churches, they delivered the decree of the circumcision to them and encouraged them to continue in faith in the Word of God. When Paul and Silas had arrived at Asia, the Holy Spirit forbade them to preach the word there. When Paul came to Mysia, he wanted to go into Bithynia but the Holy Spirit told him not to go in. After that, Paul and Silas came to Troas. At night, Paul had a vision of a Macedonian man asking him to come over to Macedonia and help them. When Paul woke up, he departed for Macedonia.